Awarded 2006 Nursery Product of the Year, Australian Toy, Hobby and Nursery Fair. 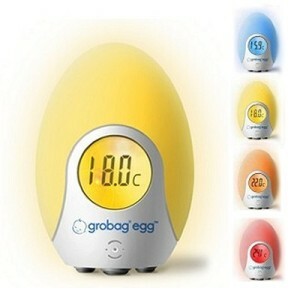 Peace of mind at a glance - The innovative grobag egg changes colour to let you know at a glance whether the temperature of a room is too low, too high or just right, helping you maintain a safe sleeping environment for your baby. As an added bonus it even works well as a gentle night light. A yellow glow suggests a comfortable temperature for children to sleep in, whilst a blue glow suggests it's too cold and a red glow suggests it's too high. The colours act as a reminder for you to cool or heat the room, to modify the baby's clothing, to use a different sleeping bag or for non-sleeping bag users to alter the level of bedding.